Scarborough Marina | Enjoy your boating! Enjoy your boating! Clean, modern marina facilities in a friendly welcoming environment. A valet service for your boat! - offering dry rack storage for your power boat up to 10M. What great benefits! Well-equipped, modern boatyard, able to handle a large range of your boat servicing needs. Ideally situated in Scarborough Harbour on the beautiful Redcliffe Peninsula, north of Brisbane. Pricing and current specials for Marina Berth, Drystack and Boatyard. Scarborough Marina is ideally situated only 40 minutes from the Brisbane CBD in the protected all-weather Scarborough Boat Harbour on the tip of the Redcliffe Peninsula. The marina provides direct access to the cruising waters of beautiful Moreton Bay as well as local and offshore fishing grounds. Nearby destinations include Moreton Island, Pumicestone Passage, Redcliffe and many other boating destinations. Close to the marina are restaurants, coffee shops and other facilities. Scarborough Marina provides outstanding berth rental, hardstand and drystack facilities at competitive rates. The marina offers full boat yard facilities with both a 35 tonne marine travel lift and a Wiggins marine forklift. All major hardstand services and facilities are available with a range of quality onsite tenant services. Drystack boat service with launch and retrieval is available for power boats up to 10M. 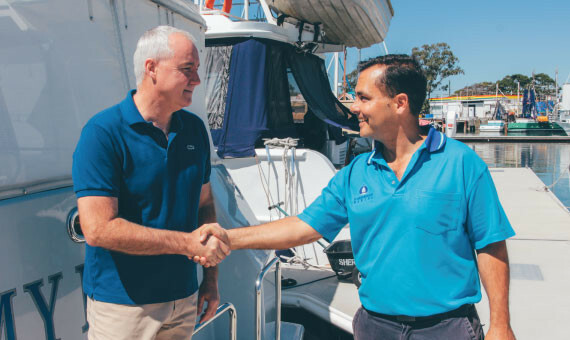 Scarborough Marina is one of Brisbane's premier marinas and offers customers the perfect boating experience.